Gather fireside with the crew to reflect on the day's adventures, and plan for tomorrow's. Jetted hot tubs with mountain views ensure maximum relaxation, so stay in as long as you like. Staying in the heart of Heavenly guarantees your crew a truly divine ski trip. Ample seating and a cozy fireplace make this the perfect spot to catch up on your book club read. Be first in line for the Gondola lift, only a 5 minute walk away. Go from suite to slopes in minutes flat thanks to ski-in/ski-out access. Stroll the beautiful property with your sweetheart while admiring the scenic Sierras. Visit Serenity Spa for a relaxing massage, facial, or body wrap - why not all three? Take a traditional aprés soak at one of two open-air hot tubs. Lace up your hikers, Van Sickle State Park Trailhead is a 10 minute walk from the resort. Brush up on your game at Bijou Municipal Golf Course, a 7 minute drive away. Awarded the 2016 Certificate of Excellence from TripAdvisor, Grand Residences by Marriott Lake Tahoe is nestled inside Heavenly Village, within easy shop-browsing distance. The views are so amazing, you’ll wish you could bottle them and bring them home. (Instagram shots will have to suffice.) You’re steps from the Heavenly gondola so there’s no need to rush through breakfast – do it up right with the full, sit-down deal. After an epic day on the slopes and a leisurely après stop for sips and snacks, change into swimsuits, grab goggles and towels and brave the brisk temps on the walk to the outdoor heated pool. (Well worth the shivers, once you’re in.) Soak in either of the poolside hot tubs until you can feel your toes again, while still keeping an eye on the kids. Make plans to hit the fitness center on your non-mountain days, then stop by the sauna or steam room for some post-workout relaxation. Kick your escape plan up a notch with a massage treatment, body wrap or facial at the aptly named Serenity Spa. Guests have an all-access pass to the activities center at nearby Timber Lodge, buzzing with all-ages to-do’s. Get in on the bingo, family movie and s’mores action. Or join in on the adults-only morning power walk, Texas Hold ‘Em, and glass painting. There’s even a just-for-teens Comedy Hour, Arcade Night and Wii Hour. And younger kids will love face painting, Fun with Foam and Cartoons and Cereal. 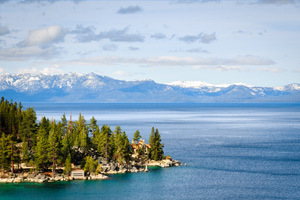 During the summer, Heavenly is a haven for boating, hiking and mountain biking. Winter activities are all about the snow: sleigh riding, sledding, skiing and snowshoeing. Got a few shoppers (or mini shoppers-in-training) among you? Head to The Shops at Heavenly Village. Little Blue House by Hatley features daywear, pajamas, outerwear and swimsuits in cute prints. Hodge Podge is stuffed to the gills with souvenirs, games and toys. And Sock City lives up to its name. Hungry? Hit up Base Camp Pizza for gourmet pizza and pasta – although after that carb-fest you may want to come back another time for treats at the Nestle Toll House Cafe. Or get them to go. Stays that cross Thursday and Friday nights may require a room move as this is an ownership resort. For more details, please contact the office using the information on the reservation confirmation received after booking.